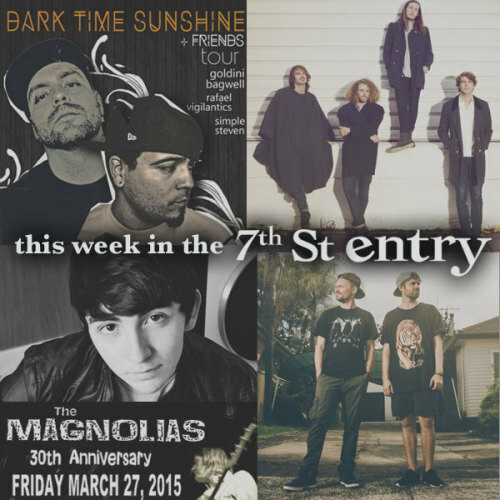 Opening the week in the 7th St Entry will be a long lineup of bands from the city of St Paul. Timisarocker is an American punk band from Saint Paul, MN. Formed in 2014, these punks have a sound similar to the 1960s but a look from the 21st century. Named after the lead singer, the band members consist of vocalist Timothy Dooley, rhythm and lead guitarist Matthew Burris, bassist Dylan Dykstra and drummer Bryan Oby. Harakiri is a progressive, indie, rock band whose charismatic stage performances and eclectic style changes create a parallel to The Mars Volta. That being paired with soaring three part vocal harmonies and riff based guitar work embody the spirit of Freddy Mercury and Queen. All the while being compared to Incubus for their melancholy 90's vibe and unconventional song structure. Popshot is a thrash pop punk band that will probably hurt your feelings. Aleko Loughrey (guitarist/lead vocals), Nick Holmes (bassist/backing vocals), Mathew Simons (drums) will open up the night on Monday. The name Desert Noises—like many of the band's songs on their debut full-length 27 Ways—came out of a dream that popped into front-man Kyle Henderson's head while sleeping. “I just woke up and wrote it down on a piece of paper,” says the 24-year-old, who used it for the band he'd first formed with his brother and a friend in the Provo/Orem, Utah, area. Joined by fellow twenty-something cohorts in bassist Tyler Osmond, guitarist Patrick Boyer and drummer Brennan Allen, the foursome set out in a van three years ago and haven't stopped since. Special guests of the night will include, Santah who was born with their feet planted in the ground and their heads in the clouds. Composed of guitarist/vocalist Stanton McConnell, drummer Steven Plock, bassist Otto Stuparitz, and Tommy Trafton on keyboards, the quintet met at the University of Illinois and with their debut full-length record, White Noise Bed, they have assembled a kaleidoscopic opus whose reach extends far beyond the Midwest. Ruben, consisting of four musicians from Minnesota, formed out of the pure joy of creating music and harmony. With influences ranging from rock n roll, to soul and pop, to the encompassing sonic force of the wall of sound, their music follows no set course, and often takes the shape of whatever it pleases. Songs are often layered with close harmonies, riffing guitars and warm horns. Shelltoe, born Steve Shelito is a hip-hop artist born, raised, and currently residing in Minnesota. In a short time he has established himself as one of the premier battle MC's in the area, winning battles such as the Scribble Jam MPLS prelim in 2008, Death Session round 2 and the Twin Cities Battle League Finals. Shelltoe is 1/3 of the emcees in a group called Bottom Feeders, and has performed at shows locally and nationally with numerous hip-hop notables. With earnest lyrics, passionate delivery and a charismatic stage presence, Shelltoe has carved out a niche all over the country. Tony Phantom is an underground Rapper/Producer from Minneapolis, Minnesota working solo and as 1/4 of the group Wide Eyes. Tony has been writing, recording, and performing frequently in Minneapolis and abroad since 2004. Tony strives to make music that lies "outside the norm" of what people expect from rap music. Other rappers such as Manny Phesto, Moonlight Grammar, Omen, and DJ J-Walk will also be spittin' game at the 7th St Entry to assist in the Sumac Tape (Shelltoe) and Lake Effect (Tony Phantom) dual release. Hermitude consists of El Gusto & Luke Dubs, an award-winning duo based in Sydney, Australia. With music in their blood, Hermitude formed in the early 2000s after playing live together in various bands from an early age. Their first EP was the vinyl-only Imaginary Friends, shortly followed by their debut album Alleys to Valleys. These were both released by the indie label Elefant Traks, the beginning of a long association between them. Recently the duo dropped the single ‘Ukiyo', and only a few months later it had millions of plays. In October of 2014, Hermitude toured North America for the first time, supporting Rüfüs Du Sol. Their unique and dynamic live show blew away booking agents across the USA and Europe, who were not accustomed to such a tight, concert-like performance from an electronic duo. In January 2015, ‘Through The Roof', the first official single from the new album dropped, and the duo has plans of performing on a run of prominent US festivals, including Governor's Ball in NYC, Buku Festival in New Orleans and SXSW in Austin, TX. The Magnolias have been a revered Minneapolis power-pop institution for more than a quarter century, bringing their intensely tight, high-energy Buzzcocks / Clash / Undertones-influenced rock to audiences throughout the United States beginning in 1984. The band enjoyed an initial stint on Minneapolis' famed Twin-Tone Records, as well as Alias, Veto and SMA. The Magnolias are fronted by singer/guitarist John Freeman, the only member to fly The Magnolias flag non-stop since the group's inception in 1984 and who spearheaded the band's revival. Their current lineup includes re-recruited lead guitarist Mike Leonard, who had been in the group from 1993-95 and drummer Pat Mckenna who played with Freeman in The Pushbacks (1997-2000). The band is complete with the rediscovery of bass talent Kyle Killorin, whose service to The Magnolias dates to 1987. Special guests in the Entry are local bands Kevin Bowe and the Okemah Prophets and The Badinovs. Singer, songwriter, and multi-instrumentalist Dylan Gardner is the kind of inspired artist who comes along rarely, possessing sophistication well beyond his years. His earliest memory, musical or otherwise, is of playing maracas onstage during a performance of “Hang on Sloopy” at the age of four with his dad's band. Gangly and bespectacled offstage, Dylan is a self-described “music nerd.” He collects classic '60s rock albums (The Beatles, The Beach Boys, Bob Dylan, The Rolling Stones, and The Doors are particular favorites). He owns a thousand vinyl records. He can play every Ben Folds song ever written. Dark Time Sunshine is comprised of Onry Ozzborn of Grayskul (Rhymesayers) and producer Zavala. Onry and Zavala first met and collaborated while working on mutual friend and rap artist Sleep's Hesitation Wounds in 2009 (Strange Famous). After this session the two continued their collaborative efforts and began amassing a collection of songs, melding Onry's debonair persona and wordplay with Zavala's strikingly innovative production to create Dark Time Sunshine's signature sound. Omaha, NE's Twinsmith will release their sophomore album Alligator Years on May 5, 2015 via Saddle Creek – their first full-length for the label. Alligator Years expands upon the charming surfy haze of Twinsmith's 2013 eponymous album and "Honestly" single, with the band pushing themselves musically while moving toward a more dynamic pop sound. Each diverse track is imbued with an individual voice and style, and ranges from propulsive, melodic rock ("Seventeen") to buoyantly playful pop ("Alligator Years") from soaring, sing-along retro pop ("Is It Me") to sumptuous, evocative new wave ("Constant Love"); from shimmery, summery pop ("Said and Done", "Haunts") to moody, slowburning ballads ("Dust", "Carry On"). Special guest for the night will be The Olympics, an indie rock group out of Iowa City who excel at weaving catchy riffs and melodies into a unique brand of pop music that makes for an upbeat live show. Little Village Magazine boasts The Olympics as "one of the most prominent bands in Iowa today" while TV personality Yale Cohn also claims "...The Olympics, one of the best young bands in Iowa..."